Recently, a reader purchased a house built circa 1900-1910 in the Detroit-Shoreway neighborhood. When she removed the vinyl siding that had been installed by a previous owner, she discovered a considerable amount of original detail hidden underneath. Some areas had clapboard siding, while others had wooden shingles. Trim was present around the windows that had been covered by the siding. Overall, the house had quite a bit more detail and character than one might have initially recognized. The wood underneath the vinyl siding was in good shape, so she decided she would paint it. She came to us because she wanted to know what historically correct colors for the neighborhood or the city would be. For most of the neighborhoods in the greater Cleveland area, there aren't any resources that give a good idea as to what historically appropriate colors for the houses of a given style would be. There are resources, however, that will tell you what would be historically for a given style, but just not specific to the Cleveland area. Different colors would have been historically more popular in different parts of the country, just as now you'll see a different concentration of automobile colors in, say, Miami that you will find here, even though the set of color choices available from the automobile manufacturers is the same. The easiest thing to do is to figure out which colors your house was originally. Unless your house is in really bad shape and all of the exterior paint has peeled away, this should be relatively easy to determine. Take a utility knife or razor blade and cut through the paint at an angle. This will reveal the various layers of color on the house. The bottommost layer will be the original color of the house - it might just be a color you would like. Some neighborhoods do have guides that provide some ideas as to historically appropriate colors. Shaker Village Colors lists appropriate original colors for Shaker Heights houses. One might be surprised to see how intense some of the colors are - the "emerald green", suggested for trim for some houses, or the "Tudor brown" suggested as a trim color, which is much darker than the brown one often sees on Tudor-style houses. For Ohio City and some of the neighborhoods of a similar age, the book Those Wonderful Old Houses : a Handbook for Homeowners can provide some very useful information as well. Cleveland Public Library has several copies that can be checked out or sent to your local branch at your request. 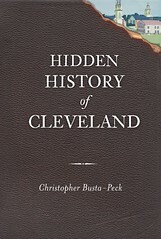 For other styles and areas, Cleveland Public Library can often supply books that provide some idea as to historically accurate colors, even if that information is not specific to this region. Paint in America: the colors of historic buildings by Roger W. Moss would be one example. Books on individual styles, say, Victorian or Queen Anne or bungalows will provide many ideas about possible color palettes. The librarians in the Fine Arts department of Cleveland Public Library can help you locate books about houses in styles similar to yours and send them to your neighborhood branch. The Fine Arts department can be reached at (216) 623-2848. We would like to compile a more complete set of information regarding historic home colors. If, when you learn what color your house was originally, you could share this information, through a photograph or other means, we would appreciate it. According to their website, the Cleveland Restoration Society offers historic color consultations as part of their Heritage Home program. The colors of our "Hattler House" are all historically accurate for the time period, and we chose a large number of colors based on the period. It cost a little more, but not as much as you would expect. When our friends repainted, they added a 4th color and it changed the look of the entire house! For houses built in the 19th century number of colors are often as important as choice of colors.